Eric Labaye is a Senior Partner of McKinsey & Company based in Paris. He works extensively for clients globally in the Telecom, Media, High-tech, Energy and industrial sectors, and also for public & health institutions on a variety of strategic and operational issues including major transformation programs, reorganization, acquisition and post-merger management and digitization. He is member of the Council of the McKinsey Global Institute (of which he was chairman 2010-2016) and of the Global Client Council. 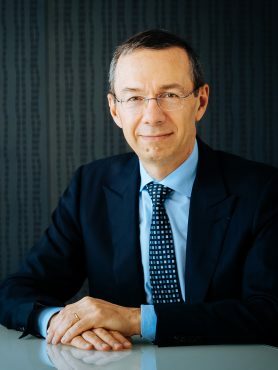 He served as Managing Partner of McKinsey’s France Office (2002-2010), as a member of the Global Operating Committee of the firm (2010-2013) and on the Shareholders Council (global board) for 9 years chairing the client committee. Eric leads major research projects with the McKinsey Global Institute in the fields of economic development, education, productivity, digital transformation, the future of Europe, as well as McKinsey’s “Women Matter” research program, which since 2007 aims to promote gender diversity in senior management at large companies. He was a member of the “Commission pour la Libération de la Croissance Française” (Release Growth in France ; 2007-2010), and a member of the “Commission Economique de la Nation” (French National Economic Commission ; 2005-2014). He is a member of the board of Telecom ParisTech, the International Advisory Board of ESSEC, and the board of Advisors of the School of Public Affairs of Sciences Po. In 2009, he was a member of the Commission in charge of defining a new model for the French University Hospital system and the development of IHU (University Hospital Institutes). He is a graduate of Ecole Polytechnique and Telecom ParisTech and holds an MBA with distinction (Henry Ford II award) from INSEAD.